There is something about the aroma of onions and peppers grilling or sautéing in butter or extra virgin olive oil, and it brings back memories of grilled sausage with onions and peppers, which is a staple accompaniment with the ritualistic red beans rice every Monday in New Orleans. The combination of the two just seems like one of those food ingredients matched in heaven. These two ingredients are included in this recipe, which is an adaptation of a “Seafood Paella” recipe from the Weight Watchers cookbook Simple and Classic Home Cooking, and found on page 68 in the Fish & Shellfish section. Recipe Retool: Once again, this recipe is being adapted to fit more with our own style of cooking, and have made several updates to improve upon the style and complexity, without loosing any of the original flavors. The recipe title is the first change updated to reflect mutually in ingredients and procedures, several ingredient quantities were increased, and the procedures for preparation steps modified as well. The original recipe named “Seafood Paella” utilizes Arborio rice and is prepared much like a risotto; therefore, as our first update we have added “Risotto” to the recipe title. Thought about removing the “Paella” portion of the title since there is no sausage in the dish, but with the paprika and saffron the name persists. 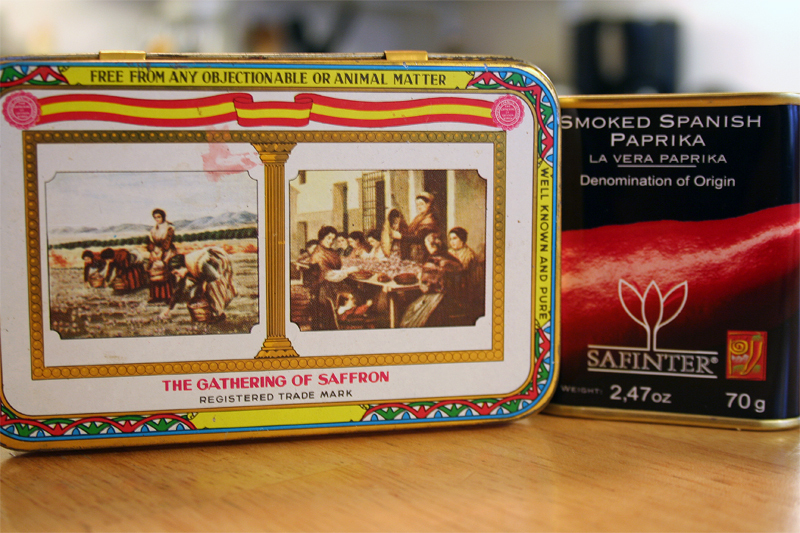 The original recipe calls for ½ teaspoon of saffron, I have increased the amount to 1 full teaspoon. In addition, smoky paprika replaced the plain paprika in the original recipe and increased from ¼ teaspoon to a full teaspoon. The onion, bell pepper, and garlic amounts were also increased by the following amounts: onion from 1 cup to 2 cups, and the recipe called for sliced onion, I made them julienne, bell pepper from 1 ¼ cups to 2 cups, and changed the diced to diced on a bias cut, and garlic from 3 cloves to 8 cloves. The original procedures call for the rice to cook for 1 minute, with the onions, bell pepper, and garlic before adding the stock; we cooked the rice for about 2 minutes or so, stirring well. The recipe also called for ½ pound of shrimp, we bought 1 pound of shell on shrimp and peeled them with the tail on, so the actual weight was more like ¾ (12-ounces) of a pound. The original recipe calls for boiling the stock for 10 minutes with the paprika, saffron, and black pepper. I brought these ingredients to a boil, and then simmered on low for the 10 minutes. I add the garlic to the sauté onions and peppers several minutes later, in the original recipe the garlic is added initially with them. I like to reserve minced garlic for later in the sauté process as it tends to burn if allowed to cook too long. The original procedure also calls for stirring in the shrimp and scallops with the tomatoes and corn and cooking an additional 10 minutes or until all liquid is absorbed. I omitted the seafood in this step and allowed the tomatoes and corn to cook 10 minutes on their own, then I added the seafood and continue to simmer for another 5 minutes uncovered, this keeps from overcooking the seafood. Other Considerations: For future reference, some char grilled corn on the cob, then cut the kernels right off and into the saucepan in place of the canned corn would add a completely new flavor and dimension to this dish. In addition, seafood stock in place of the chicken stock would change the flavor profile up a bit. 1. Combine the chicken stock, saffron threads, black pepper, and smoky paprika in a 2-quart saucepan. Bring to a boil, and then reduce heat to a low simmer to keep warm. 2. Meanwhile, in a large sauté pan add the olive oil over a medium-high heat. Sauté the onions and peppers until tender, and then add the garlic. Stir well to combine as the ingredients cook. 3. Add the rice and stir well to incorporate and allow to cook for several minutes. Then slowly stir in the warm stock mixture and reduce heat to simmer, uncovered for 10 minutes. 4. Stir in the tomatoes and corn, and continue to simmer another 10 minutes, stirring often. 5. Add the shrimp and scallops and stir well, continue to simmer another 5 minutes or until liquid is absorbed, stirring occasionally. 6. Turn off heat, cover, and allow to rest for five minutes. This recipe yields approximately 8 one-cup servings, and the nutritional values of the original recipe my be altered with the addition of the extra onions, bell peppers, garlic and shrimp: 6 WW points value, 279 calories, 42.4g carbohydrates, 4.6g fat, 1.7g fiber, 16.3g protein, 48mg cholesterol, 673mg sodium, 31mg calcium. I agree with you – it’s much more of a risotto isn’t it? Looks delicious! I need to break out some more WW friendly dishes myself to reign in these ole hips! Since starting food blogging, well it ain’t purty. This is a good recipe for shrimp! Ah, and fresh corn right off the cob – can’t wait!! Some decent tomatoes would be welcomed too. Winter go away!! This sounds just so delicious – I love your use of smoked paprika, fantastic flavors! I actually have all the ingredients to make this tonight! I have to agree! There is something about the smell of onions cooking in butter or olive oil! People just love that smell! What a delicious looking recipe! Risotto is one of my favorites! Shrimp is my favorite seafood! This is simply delightful can eat a whole plate and more! I know, what is it about the smell of onions cooking? It’s insanely good. Mmm, you’re right – I can see how some grilled corm would be so fabulous in this dish. Mmmmmm…. this looks so good! I want this for dinner tonight. So happy to see a Weight Watchers recipe that has amazing flavors in it! I love the addition of corn here as well! Delicious! Wow happy Lent for me! this is really yummy. A personal favorite of me and my mom. I wish I can pull this one off, I really want to learn to cook Paella! Its the best, all my favorites are in their already. Perfect! 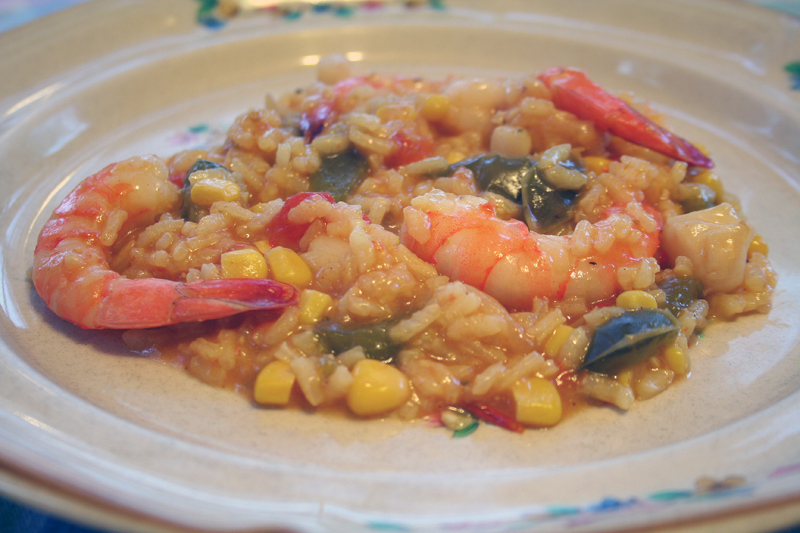 I love risotto and the fact that it has shrimp makes it even better! I love shrimp and corn! I agree that adding grilled corn as an alternative for the canned kernels will give this dish variation in texture. When we usually make Paella, we have mussels (replacing scallops), clams and squids. My mother would usually add chicken strips and canned green peas to add color. I love this great for lenten season…shrimp yummy!! Mmmm….looks very delicious with all those shrimps in it…my favourite! I have never really had any luck with risotto, but I keep trying. I would have to leave out the smoky paprika as I really don’t like the “smoke” taste in food unless it comes from a smokey bbq…. This dish looks awesome and can’t wait to find some nice shrimp and try this risotto. That is one hell of flavour heaven! I must get saffron on the weekend. This looks really yummy my type of food. Thanks for stopping by my blog and commenting. You rad my mind. Just moving into Florida and coming across incredible fresh seafood. I love rice and seafood so this is going to be fun to play with. Hi Chef Ryan! Thank you for stopping by my blog. I’m an amateur blogger so somehow your comment got put into my spam folder and I hadn’t noticed it till now. Sorry for the late approval. Your food looks absolutely amazing. I’ve got so much to learn from you. Made this last night it was fantastic~ thanks again….